Last week we saw the slippery way in which Meursault tells his story from different points along the way, without drawing attention to the fact that he’s doing it. I left you with the opening lines of the story, which contain the first of Meursault’s time-slips, with an invitation to look at the verb tenses and catch him in the act. Aujourd’hui, maman est morte. Ou peut-être hier, je ne sais pas. J’ai reçu un télégramme de l’asile: “Mère décédée. Enterrement demain. Sentiments distingués.” Cela ne veut rien dire. C’était peut-être hier. L’asile de vieillards est à Marengo, à quatre-vingts kilomètres d’Alger. Je prendrai l’autobus à deux heures et j’arriverai dans l’après-midi. Ainsi, je pourrai veiller et je rentrerai demain soir. J’ai demandé deux jours de congé à mon patron et il ne pouvait pas me les refuser avec une excuse pareille. […] Pour le moment, c’est un peu comme si maman n’était pas morte. Après l’enterrement, au contraire, ce sera une affaire classée et tout aura revêtu une allure plus officielle. J’ai pris l’autobus à deux heures. Il faisait très chaud. You can see first of all just how complex it all is when you use tenses to work out how everything relates to everything else in time. In the first two paragraphs, the present tense is used to set the scene with facts (L’asile de vieillards est à Marengo) and to tell us Meursault’s current situation (he doesn’t know when his mother died, the line in the telegram doesn’t mean much, it is a bit like she’s not dead). From that present tense anchoring us in now, we head back to events in the past: his mother died, he received a telegram about it, he asked his boss for some leave. With the imperfect we get a situation in the past (his boss wasn’t able to refuse), and a hypothetical alternative present (it feels as if she weren’t dead). We look ahead to a future in which Meursault will get the bus, will arrive at the old people’s home, will watch over the body, will come back home, and the whole business will be over and done with. And finally Meursault imagines looking back to the past from the future, from which point everything will have taken on a much more official air. So, as you see, the opening lines establish a knot of past and future events around Meursault’s now, from which he’s telling his story, a point after getting the news of his mother’s death and speaking to his boss, but before heading off to the funeral. Straight away, though, when we get to the third paragraph, this now has shifted. The action that Meursault got on the bus and the situation that it was hot are now in past tenses, which means the events are in Meursault’s past, and his storytelling now must have shifted some way into the future. There are other odd little references to the storytelling now in the book. In Chapter Four, as Meursault is telling us about the day Raymond’s attack on his girlfriend brought a policeman to the flat, he starts by saying what happened ‘ce matin’ suggesting that he’s narrating the chapter from later the same day. And the last chapter of the novel seems to pull a similar trick to the first: the opening lines are narrated from a now before the prison chaplain has come into Meursault’s cell, and then at some point we jump forward, and the chaplain’s visit is told in the past tense. That means there are at least five different points from which the story is told, and probably more — perhaps every chapter is told from a different moment in time. So what’s the point of doing this? One important effect is that it makes the novel immediate. Meursault is always telling his story from a point close to the action, either in the heart of events or shortly afterwards when they’re fresh in his mind. This makes the novel much more vivid, and allows us to share Meursault’s experience much more closely, than we would if he were telling us the story retrospectively from a point after it was all over. Secondly, a related effect is that the story being told feels raw. Because he’s telling us the story more or less as it happens, he hasn’t had much time to process or analyse it. That means he gives it to us straight, without having really thought deeply about what things mean, but also without trying to present things in a way that might put him in a good light. This makes the storytelling seem honest and sincere. And lastly, the intermittent time of narrating means that Meursault has no hindsight. As he’s telling us about the funeral, he doesn’t know the terrible consequences that his trivial actions will have when they’re brought up at his trial as evidence of his heartless nature. As he agrees to write a letter for Raymond, he doesn’t know that he’s taking the first step along the road to his own conviction for murder. Camus’s philosophy of life, like that of his friend, Jean-Paul Sartre, emphasised the randomness of life. For them, life, unlike stories, was not heading for a particular conclusion and had no meaning or message to impart along the way. Camus’s way of telling his story as it goes along is part of his attempt to capture a vivid sense of life as unplanned and unpredictable. As a guy who takes life as it comes, going with the flow without too much thought or effort, Meursault doesn’t seem the type to keep a diary. Nor is he the sort of person who’d be writing an autobiography for publication, or even someone likely to recount his story to friends over a drink. This might be why the novel keeps its unusual storytelling in the background. We’re meant to feel that the narration is close to the action, but perhaps not enquire too closely as to how, why, and to whom Meursault is telling his story. L’Étranger: When does Meursault tell his story? It’s one of the most famous opening lines in modern literature. And it sounds like it answers our question right away. If Meursault says his mother died today, then, clearly, that’s when he’s telling us his story: on the day that he gets the telegram from the old people’s home informing him of her death. Except that can’t be right, because everything in the story happens after that moment, and he can’t tell his story before it happens. We follow Meursault through the funeral, through work and leisure back home in Algers, through the shooting on the beach, imprisonment, trial and verdict, and by the time we reach the end of the story, a year has passed and summer has come around again. The last sentence of the book is narrated in the past tense (‘il me restait à souhaiter…’) from a point some time after Meursault has thrown the chaplain out of his prison cell and (we presume) before he gets his head chopped off by the guillotine. So the Meursault telling the story on the last page of the novel is at least a year older than the one who started it on page one. Most stories that are told in the past tense by a first-person narrator, as L’Étranger is, pick a moment some time after the whole tale is finished and make that their time of narrating (the ‘now’ of the storytelling voice). One of the unusual things about L’Étranger is that Meursault seems to tell his story from several different points during and after the events he’s telling us about. To use the precise terms, it’s narrated intermittently (from time to time through the course of the story) rather than, as is usually the case, retrospectively (looking back from after it’s all over). Meursault, though, slips between different times of narrating without always making it clear when he’s doing it… or why. Take a look at the tenses of the verbs in this extract, and see if you can unravel how the events fit together in time, and how the time of narrating changes. Next week, we’ll pick it apart in detail together, and think about why Meursault, and Camus, might choose to tell their story this way. Last summer, Waterstones bookshops in the UK found themselves with an unlikely bestseller among their holiday beach reading. It was the English translation of the French-language debut novel of an Algerian journalist. What’s more, it was a novel that would make almost no sense to you unless you’d previously read a mid-twentieth-century French philosophical novel by a writer who’s been dead for over fifty years. 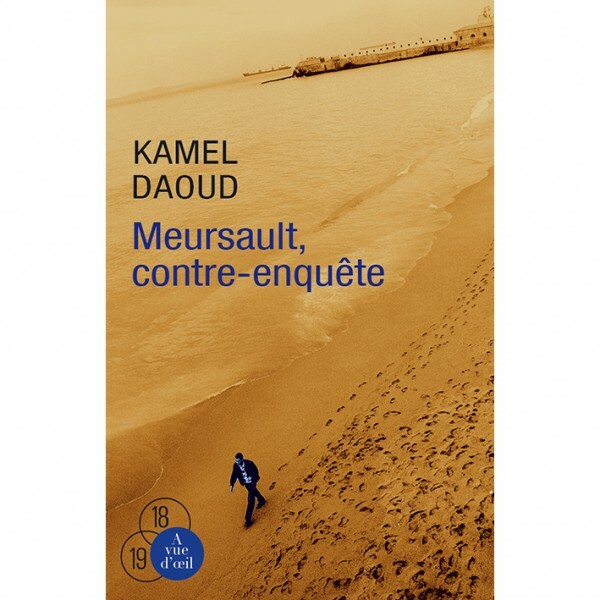 The novel is Meursault, contre-enquête by Kamel Daoud (translated as The Meursault Investigation), and it’s our choice for the Bookshelf book club. The novel has caused a great kerfuffle on the French literary scene. It’s been showered with accolades and prizes, including the Prix Goncourt for the best first novel of the year. It has also earned its author an islamist death threat for its outspoken criticism of the role of religion in Algerian life since independence. If you’d like to read a novel in French from outside France, you won’t find one with more impact, culturally and politically, than this one. Meursault, contre-enquête has a simple, brilliant idea at its heart: what if Albert Camus’s L’Etranger, perhaps the most famous French novel of the last century, was non-fiction? What if it was the autobiography of a real person called Meursault, who really did shoot an Arab man dead on the beach in the 1940s? And what if that Arab man had had a brother…? Camus’s novel tells us almost nothing about the man Meursault kills, not even his name. Daoud’s novel starts out by setting us straight on that score, sketching a hazy portrait of the dead man through the eyes of the child his brother was, and the memory of the old man he has now become. Haroun, the narrator, starts out by condemning Meursault for leaving his murdered brother’s name out of the story. It looks a little like Daoud the author might be condemning Camus for the same omission. But if you know Camus’s work, you can see there’s already something odd going on. The set-up of Daoud’s novel, as if the reader were being button-holed by an old man in a bar to listen to his story, is the exact same premise of another of Camus’s novels, La Chute. It seems a strange kind of homage in an novel meant as an attack on its subject. This recommendation comes with a few provisos. Meursault contre-enquête, although it’s short, is quite a challenging read, in French or English, so don’t let the ‘investigation’ of the title fool you into thinking you’re in for a page-turning detective story. It’s also not scared of controversy where religion is concerned, although its thoughtful critiques are a world away from the inflammatory provocations of 2015’s most notorious novel about Islam, Michel Houellebecq’s Soumission. And thirdly, as I said at the beginning, there’s no point at all in reading it unless you read L’Etranger first. If you think you can deal with all that, though, you have a remarkable reading experience in store for you. The Oxford admissions process is in the newspapers again, following a university press release listing some of the questions Oxford tutors ask candidates at interview. ‘The questions published by Oxford confirm the stereotype of the contrary and offbeat’ concludes The Guardian. ‘Are Welsh worse than English at remembering phone numbers? How to win a place at Oxford,’ offers The Mirror headline, wildly mangling a question from experimental psychology. The Telegraph bills them as the ‘unanswerable questions’ in Oxford’s ‘notoriously difficult interview process’. Commenters below the line in all the newspapers seem unimpressed with our questions and with our method of recruiting students through interviews. I see from your Personal Statement on the UCAS form that you’ve been reading L’Etranger by Albert Camus. Would it be fair to use the term “hero” to describe the main character of the novel, do you think? Admittedly, not the snappiest. But, as I tried to suggest, if we’re hoping to demystify the Oxford admissions interview, then the biggest myth we need to tackle is the one that says that Oxford interviews consist of a series of bizarre and/or impossible questions barked at the hapless candidate out of the blue and without any context to help answer them. In fact, if you read carefully what the interviewers go on to say about their questions in the press release, you’ll realize that they’re not asking impossible questions at all. Experimental psychology candidates are not asked why Welsh people are worse at remembering phone numbers, no matter what The Mirror might think. They’re given a set of data from an experiment which suggests that people whose first language is English can, on average, hold more numbers in their short-term memory than people whose first language is Welsh. They’re also told that the corresponding words for the numbers are (apparently) shorter and less complex in pronunciation in English than they are in Welsh. After having time to read and think about the data, the candidates are then asked how they might interpret it. Not the easiest thing to do in a short time and a stressful situation, of course, but not an impossible question by any means. Unanswerable questions are not on the menu in interviews for places on the modern languages course, either. If you’re invited for interview (and 88% of our applicants were last year), then you’ll have at least two interviews, with at least two interviewers present in each, so we get a good, balanced view of you. The interview itself is broadly similar for all languages and all colleges of the university. A short time before the interview, you’ll usually be given a short piece of literary writing to read — a poem or prose extract from a novel — usually in the foreign language if you’re not starting from scratch. The interview will last around twenty minutes to half an hour. We’ll begin by asking you about the text you’ve been reading, starting with simple questions about what it says, and working towards more complicated issues about its themes or structure. The point is to create a dialogue and exchange ideas, not for us to trip you up with trick questions or for you to perform a fully formed explication of the text without our help. If you head off track, or miss something important, we’ll guide you back in the right direction. We’re hoping to find candidates able to listen, take on board new ideas, and change their minds when faced with new evidence. After all, we’re looking for students who are responsive to teaching, not students who know it all before they even arrive. Then, for all candidates applying for a language they’ve been studying in the sixth form, there’ll be a brief part of the interview conducted in the foreign language. Bear in mind that we already have your GCSE results, teacher references, schoolwork submission and Oxford language test, so this plays a relatively minor role in telling us what level you’ve reached in the language you’re studying. We know, too, that the interview is hardly the most relaxing environment for you to chat away in a foreign language, and we take account of the effect your nerves have on your fluency. Lastly, we need to know how well suited you are to a course that includes literary and cultural studies, and the last part of the interview will focus on this. There may be some general questions about how (or why) literature can be a subject for study, but there will probably be some more specific discussion too. Your personal statement should include some mention of your cultural interests, and if not, we’ll invite you to tell us about them. If we find out that you’ve been exploring the literature of your chosen language a little, then we’ll take some time to ask about the things you’ve been reading, and see what ideas you’ve had about them. If, for instance, I see L’Etranger mentioned on a UCAS form, I might ask the question on it that I gave earlier. What if I did ask that question, by the way? What should you answer? Well, there is no correct answer I’m waiting for you to come up with. I’d be hoping that you’d think – maybe think out loud – about the meaning of the word ‘hero’. It’s sometimes used to mean more or less the same thing as ‘main character’, so in that sense Meursault is uncontroversially the hero of L’Etranger. But, you might go on to say, the word can also imply ‘heroic’ actions or personality traits, which don’t chime well with Meursault’s thoughtlessness, indifference, and his later status as a killer without remorse. Some candidates might go further and talk about how, in spite of all that, the novel seems to be encouraging us to side with Meursault anyway, perhaps even admire him, due to the courage with which he sticks to his convictions in the face of persecution and impending death in the latter parts of the novel. Whether you finally reckon he counts as a hero or not is less important than whether you’re able to consider the implications of the question and pull together some reasons for and against. At every stage I’d be ready to offer some pointers, perhaps starting you off by asking you to consider what kinds of people are considered ‘heroic’, and how Meursault compares to them, and then seeing where you go from there. It’s far from a perfect way of choosing our students. But with candidates coming from such a wide variety of countries, backgrounds and schooling, and with many sixth-form qualifications in languages giving us only a very limited idea of how well-suited you are to the cultural side of our courses, it’s the best method I know to seek out an academic potential that might not quite fit onto your UCAS form. And it’s not an ordeal. It’s an experience. 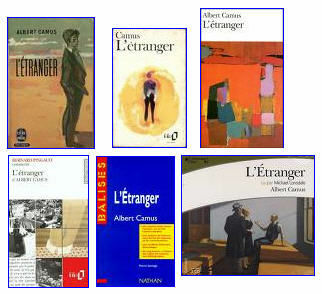 L’Étranger (usually translated as The Outsider) is probably the most widely read of all twentieth-century French novels. Marcel Proust’s A la recherche du temps perdu (In Search of Lost Time/Remembrance of Things Past) may be more famous, but not as many people get to the end of its 3000 pages. L’Étranger is short, intriguing, and written in such simple French (not a passé simple verb in sight) that it’s often the first choice for non-native-speakers wanting to try a real work of French literature in the original language. It’s the most-mentioned text on UCAS forms from prospective candidates by some margin — a fact that put me rather in two minds about including it in the book club. It’s already read by almost as many candidates as all other French literature put together, so it hardly needs my recommendation to find any more readers. But there is something special about its combination of accessible language and thought-provoking content that fully justifies its popularity. The novel is set in colonial-era Algeria (it was written in the 1940s) , and the story is told by Meursault, a French-Algerian colonist. He likes warm sunshine and swimming in the sea. He doesn’t like damp towels in the bathroom. Most things he has no opinion on at all. ‘Ça m’est égal’ (‘I don’t mind either way’) is his constant refrain. He gets on with his life, enjoying small pleasures, and staying largely detached from other people. We meet him as he is told of his mother’s death and summoned to the old people’s home for her funeral. After that event, during which he smokes a cigarette by the coffin and sheds no tears at the graveside, we follow him on a trip to the beach with a girl, and through the events of an ordinary day. Everything changes when Meursault is drawn into a feud between his disreputable neighbour, Raymond, and the family of Raymond’s Arab girlfriend, who is in an abusive relationship with him. 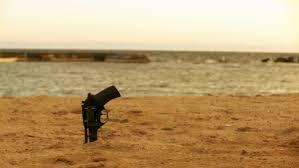 Following a brawl at the beach with the girlfriend’s brother and other men, Meursault shoots one of them, in an act for which he offers no motivation other than that he was dazzled and disoriented by the sun. The second half of the novel deals with Meursault’s trial. To Meursault’s bemusement (and here the novel takes on a slightly surreal air), the circumstances of the shooting are largely disregarded by the investigators and lawyers dealing with the case. Rather, it is Meursault’s behaviour during and after his mother’s funeral that attracts the interest, and condemnation, of the establishment. In their eyes, Meursault’s greatest crime is failing to weep at his mother’s funeral, further compounded by enjoying life in the days that followed. Meursault, we realize, is being condemned for not playing by society’s rules, and for refusing to play-act emotions he does not feel in order to make other people feel comfortable. Meursault’s story is simply told. He gives us the facts of what is said and done, but offers few interpretations of his own or anyone else’s behaviour. The novel offers more questions than answers, and challenges the reader to take sides in a moral debate that’s not easy to settle (its hero is, after all, a killer without remorse, who’s also complicit in Raymond’s abuse of his girlfriend). It’s an uncomfortable read, deliberately provocative, and if you like being provoked then it’s well worth your time. It will also introduce you to the idea of the Absurd, the tragi-comic mismatch between our need to find meaning and purpose in life and the world we live in that often seems to have neither. It’s an idea that has a lot of influence on twentieth-century French literature, and is also explored, for example, in Samuel Beckett’s En attendant Godot and Jean-Paul Sartre’s La Nausée. So do go ahead and give Camus’s little masterpiece a try. But do also remember that Other French Novels Are Available.